Classic car insurance is typically less expensive than a standard auto insurance policy. Specialty car insurance companies are the better way to go when it comes to insuring your classic car. Specialty car insurance companies cover the agreed value of your car versus the actual cash value. Learn about several companies (specialty and regular) who offer insurance for classic cars. Classic automobile car insurance coverage can be affordable no matter what type of classic car you own. Whether you drive your classic car or use it exclusively as a show car, classic car insurance is necessary. And thankfully, you can find the coverage you need at a price you can afford. Many classic car owners go without insurance or purchase standard auto insurance because they think classic coverage is too expensive or not needed for car shows. Neither of these assumptions is true. Actually, going without the right insurance could be costly! Even if you don’t drive your vehicle, it’s imperative that you get car insurance. When an accident or theft happens, you could lose the investment you put into your uninsured classic car. Whether you have always owned your classic car, just purchased one, or have restored one, having insurance coverage will help preserve its value. We’ll show you some options and help you work through the coverage available for your classic car. To find affordable car insurance quotes for your classic car, enter your zip code now! – What is the difference between classic, antique, vintage, and collector cars? – What kind of cars does classic car insurance cover? Should you get coverage through a regular car insurance company? Is classic car insurance cheaper than normal car insurance? Many people do not drive their classic cars for everyday errands but use them exclusively as show cars. Even with limited use, accidents can still happen. There are many people coming and going at car shows, and it is actually quite common for some minor bumps and scratches to occur. There is also the transportation of your vehicle to and from the car show — either by driving or being towed in a trailer. The risk for an accident exists in these situations as well. When it comes to repairing a classic car, even minor bumps, dents, and scratches can be expensive to fix without insurance. Having automobile coverage on your classic car will pay for any repairs that need to take place if it is damaged at a car show. Now, before we get too far, let’s get clear on a few terms. Before you can seek coverage, it’s important to get a handle on defining your type of car. Is your car antique, classic, vintage, or collectible? Antique – Generally speaking, if a car is more than 25 years old, it is considered an antique. Some states, however, call a car “antique” if it is at least 20 years old, while the Antique Automobile Club of America says a car must be a minimum of 45 years old. The condition of the car is also what qualifies it as an antique. A car that is an antique has usually been restored, is well taken care of, and has some resale value. Classic – Typically, companies call a car “classic” if it is 19 to 24 years old, has been restored, drives well, and is worth more than other vehicles of the same make and model year. In some circles, the words “antique” and “classic” are interchangeable, whereas in others, the word “classic” means a car that is 50 years old or more. Some classic car insurance companies say a classic car can be just over 10 years old, whereas if your car was made between 1925 and 1948, The Classic Car Club of America considers yours a classic. Vintage – If your car was built between 1919 and 1930, it is likely a “vintage” vehicle, but an insurance company may consider it “antique” or “classic” instead. No matter which way you slice these terms, be sure to ask your prospective insurance company about their definition of these words. Though many car insurance companies use “classic car insurance” as an umbrella term for antique, classic, vintage, and collector cars, it’s still important to differentiate which type your vehicle is to ensure you’re getting the quality coverage you need. With the same insurer, the policy for your vintage car would look different than a policy for someone’s collector car. Just remember that antique, classic, vintage, and collectible cars’ values increase with time instead of depreciating. Just because a car is old doesn’t mean it should be considered a classic, antique, etc. Insuring an old car is not the same as insuring a car that fits into the aforementioned categories. Read on to find out the types of cars classic coverage protects! Now that you have insight into the general “old car” definitions, you’re probably wondering what specific types of cars can be eligible for classic car insurance coverage (or “collector & classic car insurance” or “antique and classic car insurance” or “specialty car insurance” — whatever your company may call this type of insurance). Is classic coverage right for you? We’ll help you find the answer next. Some people think that going with their family insurance company is a good idea because insurance companies typically offer a discount for multiple cars and policies, but that’s not always the best choice. A typical car insurance company will not take into consideration the restored value of the vehicle. They only take into consideration what you paid for the vehicle or the actual cash value. For example, if you paid $8,000 for a car that needed a lot of work and you put an equal amount of money into restoring the car, you would have spent $16,000. But now that the vehicle is in mint condition, it could sell for $50,000. If you go with a typical policy, you would only receive $8,000 should something happen to your vehicle. If you are thinking about skimping on insurance because you only drive your vehicle to and from car cruise events, think again. Car cruise events are often crowded with a lot of vehicles in the mix. It is one of the most likely places to receive a fender bender or worse. Don’t jeopardize the value of your car just to save a few bucks. If you are going to spend the money to make a vehicle into a true antique or classic car, spend the money to protect your investment. You, the driver, need to be of a particular age or older. The classic car cannot be driven for business reasons; it can only be driven for particular activities. We’ll show you what to expect for pricing, next. Collectible car insurance is determined in a similar way as regular car insurance. However, coverage for classic vehicles is usually less expensive than regular car insurance because you drive your car less and probably often keep it protected in a garage and in prime condition. Plus, a standard auto insurance policy usually does not offer enough coverage to replace or repair a classic car. An antique, vintage, or classic car is often more expensive to fix, as the parts are typically harder to find and cost more, and specialty insurance offers the coverage needed to fully repair or replace the car. What’s more, on average, the cost of classic car insurance is 40 percent less than standard auto insurance rates. We took data from the NAIC for average cost of full coverage by state and deducted 40 percent to give you a ballpark on what to expect (see graphic below). You probably own’t be able to get the same discounts on antique car insurance that you would with a standard policy. A big part of your policy is insuring the value of your car, though you can keep your rates down if you have a good driving record and a good credit score. Of course, shopping around is an excellent way to ensure that you are getting the lowest insurance rates. However, many more traditional insurance companies don’t cover antique cars, so you will want to include specialty car insurance companies in your search. Before you select a company, you should check them out at the Better Business Bureau and ensure that they have a good reputation, especially if you are going with a specialty company. In addition, you can check their financial ability to pay their claims through sites such as AM Best, Standards & Poor’s, and more. You need to make sure you have an accurate assessment of the vehicle’s value so you know how much insurance you need. Once you know that, you can begin to work with an agent to develop a policy that fits your needs. Another important consideration is how often and how far you drive the car. If you only take the car out a couple times a year for parades and shows, you can have a lower mileage limit placed on the policy, thereby lowering your premium. Finally, if you are restoring a vehicle, you will need to make adjustments to your policy after doing so because the value of the car will increase. Keep all receipts and documentation for work that was completed on the car and take pictures throughout the process. These receipts will help determine an accurate assessment of the car’s new value so that you can increase your coverage appropriately. Unlike with regular vehicles, the value of an antique car will appreciate over time. For this reason, it will be important to review your policy every few years to make sure that you continue to have enough coverage should anything happen. To make sure your classic car is properly insured, you can go through a standard company that accepts Stated Value Insurance or Agreed Value Coverage. Some insurance companies offer these types of coverage, while others do not. In Stated Value Insurance, you state the value of your car, and that is the amount for which it is insured. Of course, you need to provide proof of the number you came up with, but keep in mind that your company may defer to the Actual Cash Value instead if that is a lower amount than the stated value. Some Stated Value Insurance requires that you carry a deductible, so make sure you discuss this with your insurer. Agreed Value Coverage is similar to Stated Value, except that both you and the insurance company present a value based on research, you negotiate, and you come up with a number you can both agree on. This final number is what your car is insured for, period. You want to insure your vehicle for its replacement value, not what you paid for it or what you put into it. Specialty car insurance companies — which specialize in classic/collector auto insurance — almost always stick with agreed value coverage. Many of the classic cars that are being driven on the road are actually insured by standard insurance companies, so some do offer that as a policy. Standard insurance companies tend to charge more for the premiums than specialty providers, even though they are more restrictive policies. You may find that insuring with a specialty car company will save you more money. When you are searching for a company that offers specialty classic car insurance, one of the considerations you should take into account is whether the company is financially stable. You can find that information out from insurance rating company A.M. Best. Read on to learn the benefits of going with classic car insurance! You definitely should search for specialty companies, as they offer aspects of the auto policy that standard car insurance companies may not. One situation may be that you would like to use a mechanic of your choice in the event your classic car needs repairs. You may also want to check out specialty companies if you want the car insured for the actual amount you think it is worth. To illustrate this point, consider a car you purchased in 1974 for $1400. Dealers may now offer $15,000 for that vehicle and some people have been quoted estimates as high as $21,000. If the vehicle is totaled and you have classic car insurance, you should expect to receive what the car is currently worth; however, if you insured that car with regular car insurance, you will be lucky to get your original $1400 back. Other situations for which you may need specialty coverage may include shipping your classic car somewhere overseas or out of state, or desiring premiums that are flexible and based on how many miles you drive per year. For cars at a car show, there are comprehensive reimbursement plans for any damage to the car, including accidental breakage to any parts of the car and even earthquake protection. Agreed Value Coverage – (Here’s that term again!) The classic car owner will get the full amount that covers the value of the car in case the car is totaled. Restoration Coverage – This coverage protects a classic car’s value when it is in the process of getting restored. Choice of Repair Shops – The owner takes the car to a mechanic who is familiar with the special features of classic cars. In-house Claims – The claim is handled by a collector automobile insurance expert. Flexible Usage – The classic car owner can enjoy their car within the comforts of an insurance policy limit. Next up, the top companies to consider for YOUR coverage! There are several specialty car insurance companies that exclusively offer insurance for classic, antique, vintage, and collector cars, but some “normal” car insurance companies offer plans for old cars, too. Read on to learn more about a handful of companies ready to protect your prized possession(s). Since the 1940s, Grundy Insurance has insured classic and antique cars. Grundy says they’re the first insurer to draft an antique auto policy. They also claim to have invented the agreed value policy. The Classic Car Club of America prefers Grundy over any other specialty car company. With Grundy, there is no age limit when it comes to insuring your car. In fact, they have a motor vehicle program that will insure all of your vehicles under one policy. It doesn’t matter how new or old your cars are…or whether they qualify as classic or daily go-to trucks and compact cars. And get this — it’s an agreed value policy for all of them, too! If you collect cars, they also offer global coverage for your entire collection, maximum coverage, diminution of value, 150 percent coverage cushion, and custom premiums. Click here for more details. American Collectors prides itself on satisfying customers with innovative programs and excellent service. They cover a lot of things, including earthquake damage! If you own more than one collector car, be sure to ask about their multi-vehicle discount, and look into their discounts for mature drivers, safety features, and secure garage storage. They offer a TLC Auto Plan, which they call the “most comprehensive emergency expense reimbursement of its kind.” It reimburses you for emergency expenses like towing, roadside assistance, getting locked out of your car, and more. Each level builds on the last with additional coverage options. What’s more, they don’t just insure your car collection…they insure a whole slew of other collectors’ items, such as action figures, model trains, trading cards, etc. Check here for the list. If your classic car is at least 19 years old, you can have it insured by J.C. Taylor. They have been in the specialty insurance biz since the 1960s. If you’re curious whether you and your car would be the right fit for J.C. Taylor, they make their eligibility rules clear on their website. You must be at least 25 years old and have a good driving record (especially within the last three years), and your car must be a factory original — predominantly a hobby vehicle in good or restored condition that you keep in an entirely enclosed, locked garage. Hagerty is a leader in classic and antique vehicle insurance coverage. If your classic car is being restored, you’ll want Hagerty to cover it, especially since they offer protection for all sorts of specialty vehicles — plus more coverage for spare parts than most other companies. You can also join the Hagerty Collector Network, which has over 225,000 members. To determine prices, this company has their own independently published Hagerty Price Guide, which is compiled of data they collected from auctions, dealer sales, asking prices, and peer-to-peer sales. Aside from agreed value coverage, you can expect American Modern to offer discounts that can save you up to 45 percent, between a car club membership, anti-theft devices, and an accident prevention course. Yes, that’s right — pet coverage! So, if your favorite little furry animal gets injured in your classic car, American Modern will pay up to $750 of your pet’s medical expenses. On top of all of this awesomely included stuff, American Modern offers some additional coverage options and flexible payment plans. Sounds hard to beat, right? If you’re in the market for an American classic car insurance company, you can save a lot by going with American Modern! You probably know State Farm only as a regular auto insurance company, but did you know that they also offer classic car insurance? They define a classic car as “a motor vehicle ten or more years old, which is of special historical interest” and in their eyes, an antique vehicle is at least 25 years old. They’ll insure vehicles that fit their definition, but they don’t cover any exotic vehicles, modified cars, vintage motorcycles, etc. State Farm will pay the agreed value in the event of a loss, and you can also expect up to $500 coverage for your car’s spare parts. Though they insure a lot of “normal” cars, they have a quality grasp on collector cars. So if you must go with a standard auto insurance company, give State Farm a try. Safeco provides coverage for antique and classic cars, modified collector cars, reproductions, replicas, restorations, and modern classic cars. Their policy does not cover as much as specialty insurers do, but if you want to drive your classic car often, they’re your best bet. Most people who collect classic and antique cars don’t like to drive them regularly, but if your aged vehicle is your go-to, Safeco permits up to 10,000 miles for regular use — similar to a traditional auto insurance policy. Despite the fact that they don’t cover things like spare parts or restoration, they do offer some discounts that many specialty companies do, which is cool. However, Safeco doesn’t cover kit cars, cars restored to less than 50 percent, classic race cars, or automobiles with a jet or nitrous oxide engine. Appraising the classic car before deciding on insurance is very important. It helps you understand the true value of the vehicle when compared to other vehicles in the same category. The appraisal needs to be done by a trained professional. Check out the resume of the professional before enlisting his service, and make sure that he is knowledgeable of the different makes and models of classic cars. A car cannot be insured unless its make, model, style, and color are properly appraised. The Vehicle Identification Number or the VIN is also noted because that is a major factor in proving the authentic value of the vehicle. The following are the actions of an appraiser when he gets a classic car on his territory. Once the appraisal is completed, he will then add information and photos regarding similar vehicles in the market to compare the prices. He usually gauges this information from a variety of sales and marketing journals and auction reports. This appraisal is very important because it decides the coverage you will probably receive. It will be a good idea to get ahold of an agency that specializes in a particular classic car because they are likely to understand your needs. With classic car shows in every state, you can bet that basically all of America shares an appreciation for classic cars. And since you’re here, we’re sure you do, too. 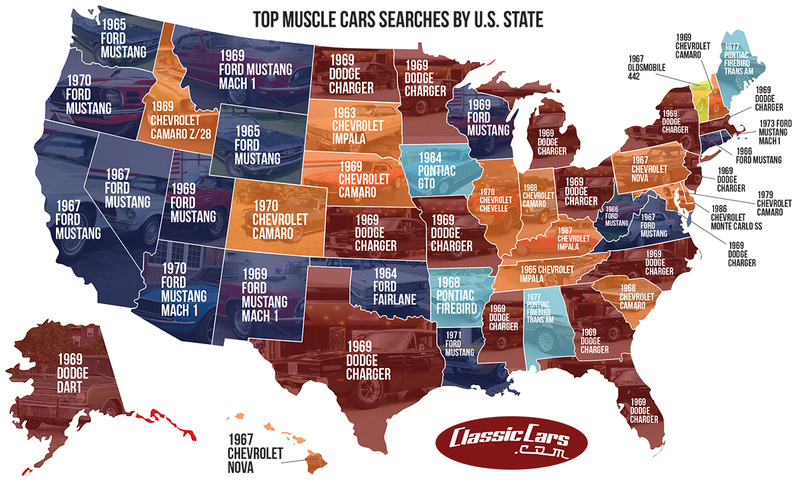 You’ll notice that the most popular car is the 1969 Dodge Charger, which is a favorite in 13 states! The Ford Mustang (with various model years) comes in second with its popularity in 10 states. When you look at the history of American classic and antique cars, you will find the Chevrolet Corvette as an icon in automobile history. It was released in 1953 and has always been renowned for speed and sophistication. If you are the proud owner of one of these antique cars, then you will want to get the best antique car insurance for your needs in order to protect your asset. The better you look after your Corvette, the more the value will increase. To ensure you have the right insurance coverage for your pride and joy, you should seek out insurance companies that specialize in the needs of a Corvette owner. You will be able to get antique car insurance that will give you the option to purchase additional coverage if you need it. This may be needed because of extra expenses you may have paid out fixing the car up. The vintage Ford Mustang has often been a favorite for car owners and collectors. This is mainly due to how enjoyable they are to drive, as well as their look and feel. They also have power and performance in equal measure. There is one aspect that is vital when looking to get antique car insurance for this model. Make sure that the insurance company will cover repairs by qualified engineers who specialize in these types of cars. Most companies claim to understand the needs of antique car owners, but you should be careful to find one that truly does understand. There are some things you may wish to consider when finding the correct insurance company for your Ford Mustang. Ensure that you can sign up for insurance online and that it is a straightforward process. Make sure that the insurance restrictions are limited. Get a guarantee that if the car is damaged, it will be repaired with the best parts available. The Chevy Camaro was first introduced to the market in 1967. It is considered to be a car that has a light body with a heavy motor. Antique Camaros have managed to maintain their value years from their release. Some models are highly sought after by collectors since they are extremely rare. You want the right coverage from your car insurance as these cars are normally more expensive than your typical car. Some insurance companies are specifically designed to cater to high-value, original vehicles such as this one. They deal with small numbers of clients in order to supply you with the best information available. They can also provide you with the best quote that is best suited to your needs. A big-block SS Camaro is going to need more insurance coverage than a small-block RS Camaro. There may be an increased premium to pay on convertibles. Ensure that the coverage takes into account travel distance needed for your car. You’ll want to understand the terms in this next section if you’re considering classic car coverage. The reason why most people don’t get the most value from their car insurance is that they selected the company using a hit-or-miss method. They look through an automobile magazine for classic cars, hoping to stumble upon some insurance ads. They receive an offer in the mail. The marketer bought their name and address from a list seller who got the owner’s personal information after they purchased something in the past that identified them as the owner of a classic car. They accidentally heard an ad on the radio or saw a commercial on television directed at owners of classic cars. A friend recommended the insurance company that they were using, although the insurer did not specialize in classic car insurance, just general insurance. While they may have gotten a low price, they probably did not get adequate cover for the special expenses associated with a classic car. Savvy shoppers are familiar with the far reach of the Internet and use Google, Yahoo, or Bing to do a search for websites that take care of their specialized needs. This method of comparison shopping for car insurance is quick and accurate because of how easy it is to find discriminating information online. In addition, the shopper can also buy their insurance directly online. Always read your policy carefully. Some classic car policies treat your car like a decoration rather than a vehicle, restricting how many miles you can drive per month or per year. If you plan on driving your classic car, shop around for a policy that has a higher mileage limit or no mileage limit at all. Other restrictions may exist on an insurance policy for a classic car. The insurance company might require that you own another car to use daily or that the classic car can only be driven under certain specified conditions. Check up on all of these restrictions before you sign a new policy, or ask about them on your current policy. Don’t try to lie to your insurance agent to get around these kinds of limits. You might get a lower rate now, but you will run into trouble if you need to file a claim. In addition, knowingly giving wrong information in this manner to your insurance company is considered fraud and could even result in criminal prosecution. Don’t let these factors overwhelm or confuse you while trying to insure your classic car. As long as you shop around and compare policies before buying, and always read your policy completely before signing anything, you shouldn’t run into problems. If you work with a specialty insurance company for your classic car, you’ll have a much easier time with your policy and get better coverage. You’ll probably end up saving money, too! Enter your ZIP code now to get multiple quotes for FREE. – What is the difference between the Agreed Value and Stated Value Insurance coverage? Stated value insurance is based on what you stated your car is worth, but of course you need to provide proof of that number first. Your insurer can then decide to cover the value you stated or the Actual Cash Value; they’ll go with the lesser amount. Agreed value (also known as guaranteed value) is based on what you and your insurer decided your vehicle is worth. You both take into account the following: photos, appraisals, and any other documentation needed to determine value. Your insurer will guarantee that they will pay this value when coverage is needed. – How is classic car insurance different from regular car insurance? Classic or antique car insurance is often cheaper than regular car insurance because you are not driving the vehicle regularly, in most cases. Another major difference between classic and regular car insurance is the way the value of the vehicle is determined. Classic car insurance offers options particular to the needs of classic car owners, while regular car insurance companies offer more standardized coverage types. – What types of classic cars do providers insure? – What types of cars are not covered under classic car insurance? – How old does my car need to be to qualify as classic? Usually 19-24 years old. There are some exceptions, as companies may define the term “classic” differently and consider a classic car to be as young as 10 years or as old as 50 years. – Do I have to keep my classic car in a garage? If you want to lower the chances of weather damage or theft to your special car, you should keep it in a garage that is fully enclosed and secure. Many classic car insurers require that you do this. – Are there any classic car insurance companies that don’t require a garage? Yes, there are companies who do not require garaging. However, you need to be up front this will be the case and do you research thorough to ensure you do run into problems if you need to file a claim. – I run a classic car limousine service. Can I get coverage? – What’s an attendance clause, and does the classic car insurance provider have one? An attendance clause requires that you stay close to your collectible vehicle no matter where it is. Most classic car insurers deem this clause unreasonable and do not include it as a part of their coverage. – Do I have to insure my other cars with my classic provider? You don’t have to, but some classic car insurers will give you a discount if you place more than one classic car on your policy. If you’ve found a specialty insurer like Grundy, you can even lump in everyday cars, too — not just the oldies. – Is it cheaper to insure a classic car? Though sometimes it all breaks down to the nitty-gritty details between car insurance companies, it is typically cheaper to insure a classic car with classic car insurance. That is, you can save an average of 40 percent, especially if you go with a specialty car insurance company.